So you already know all about all the Mad Mimi plan details, including how many audience members (or contacts) you can store and send to, for each plan level. Great! But what happens when you go over that limit? Does Mimi explode? Do flying monkeys come attack your office? Does a fairy lose its wings? Don’t worry, it’s not THAT tragic! You can go over your audience limit in a couple ways. Either you import contacts into your audience, manually, that puts you over the limit. Or, you can have a web form out there on the web, that’s collecting new subscribers — and those awesome sign ups push you over you’r limit. Good news, right?! When this happens, Mimi will let you know, right away! 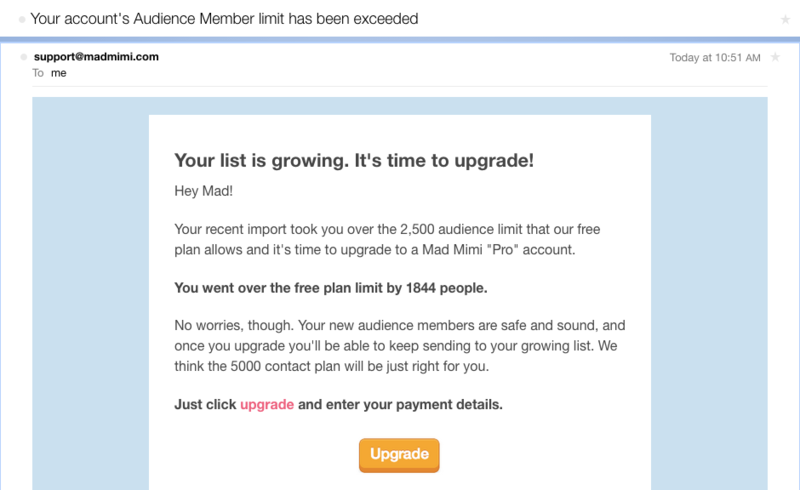 You’ll get an email notification from Mimi, telling you that you’ve gone over your audience limit. From that email notification, you can see exactly how many contacts you are over your current audience limit. You can upgrade your account level right from there or you can upgrade via the ‘Plans’ button at the top of your page when logged into your account. What happens in my account when I’m over my audience limit? While you’re audience total is over your current audience limit, you won’t be able to send any emails. This means that if you have a Drip Campaign set up — none of those emails will send. Once you’ve upgraded, you’ll need to go in and make sure the drips are running again. This also means that if you have an RSS feed email set up — that scheduled send won’t go out to our list. You’ll want to go in and click ‘Run’ to get things going again. Your sign up forms will still collect new subscribers successfully. You can even still import audience members into your account, while you’re over your current limit. But if those new signups are supposed to receive a Drip Campaign Welcome Email, for example — that Drip won’t send until your audience is back into the limits of your selected plan. You can still access your account, and everything in it. You can create new promotions, and you can import images to your gallery. Everything works just the same, except that you can’t send out any emails. What can I do to fix it, if I’m over my audience limit? This is easy — you have two options! You can either upgrade your account, to the next highest level which will fit your current “All contacts” total. Or, you can remove audience members from your account, so your total contacts are less than your current allowed limit. Keep in mind! Deleting contacts is completely permanent, so be sure that’s what you want to do, before you commit to that trashcan button! If you’re interested in reducing your audience list, we recommend getting a Views and Non-Views list generated for your account. That way, you can see which of your current contacts are engaging with your content — and which ones haven’t even opened an email, in a while. You definitely don’t want to be paying to keep those deadbeats around! Just email us and we can get this created for you, in no time! We can create Views and Non-Views lists for your accounts that cover the last month, 3 months, 6 months, and back until Feb 3, 2016. How Do I Add Contacts to a New List? How Do I Add Contacts to an Existing List?